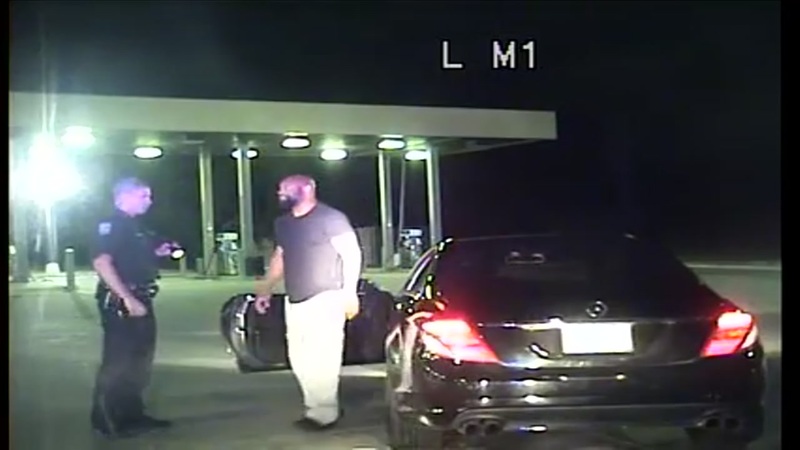 The Pearland Police Department has just released dash cam video of a traffic stop involving former Houston Oiler Lamar Lathon. PEARLAND, TX (KTRK) -- A police organization wants an apology from a former Houston Oiler, who took to social media outraged after a traffic stop. The Pearland Police Officer's Association is demanding Lamar Lathon apologize for his criticism for saying the officer who stopped him put "a gun in his face." It believes the officer did everything right and newly released dash cam video, the organization's president says, backs him up. "Making an accusation about a policeman's conduct when it's a lie is where we have to draw the line," said John DeSpain. The video shows an officer pulling Lathon over for speeding-65 in a 50 mph zone. When the officer asked for Lathon's driver's license and proof of insurance, Lathon reached under his seat. The officer pulled out his gun and ordered Lathon to stop reaching under the seat. The officer later checked the car to make sure there was no weapon, then wrote Lathon a ticket. Lathon later tried to explain he was reaching to retrieve the documents the officer requested. In the video, Lathon is heard cursing. He also was concerned about what might happen if he exited his car, as ordered. Lathon posted on Facebook he was traumatized by the traffic stop. The Pearland Police Officer's Association has asked Lathom to apologize for mischaracterizing how he was treated. "I don't feel like I need to justify anything. If they want to make me look like the bad guy, they can. Both parties should acknowledge there was a breakdown in communication," Lathon told Eyewitness News. The Pearland Police Department stands behind its officer, saying he was professional and within the law and policies. The police organization added, "As a former NFL Pro Bowler, Lathon is looked up to and considered a role model by many in the community. Mr. Lathon needs to take ownership of words and actions, and apologize to the men and women of the Pearland Police Department that fearlessly protect and serve their community in these very dangerous times." Lathon told Eyewitness News, overall, he supports law enforcement and his concerns are not about race.